The 1968 comedy The Odd Couple starring Jack Lemmon and Walter Matthau is now streaming on Netflix Instant. Stars: Jack Lemmon and Walter Matthau. Plot:Chaos ensues after neat-freak Felix (Lemmon) moves in with his schlumpy friend, Oscar (Matthau). Academy Awards: Nominated for two Oscars: Best Adapted Screenplay and Best Editing. Bottom Line: Neil Simon's evergreen comedy is quite simply hilarious. 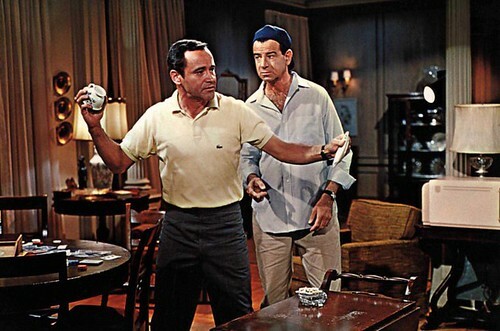 The success of the film (and all of the stage and TV versions) hinges on the chemistry between the leads, and Lemmon and Matthau, in their second of ten films together, are one of the great screen duos. Lemmon, who was one of the best natural actors Hollywood ever produced, is fantastic as the fussbudget Felix. Lemmon shows the audience how deeply wounded the sensitive Felix is by Oscar's sometimes callous behavior. Matthau is perfection as Oscar, the ultimate slob with a heart of gold. The Odd Couple created a screen persona for Matthau, which he would hone to perfection in the ensuing decades.